DB3DL, 3.6V, 1.5AH Lithium-Ion Batteries, Screwdriver, Allows For Longer Run Time & An Increase In Battery Life Cycles, Powerful & Leightweight, 44 INLBS Of Torque & Weighs Less Than 1 LB, Quick Charger, Charges 3.6V 1.5AH Batteries In Only 30 Minutes, Spindle Lock, Allows For Manual Screw Tightening/Loosening, Integrated LED Light, Integrated Light To Illuminate The Work Surface. I purchased this product for my wife, since it appears to provide a lot of flexibility in a small and light form factor. Thus my wife doesn't need my 18v DeWalt. When we opened it and looked at it, the tool is clearly a right handed tool, based on the position of the on switch. A left hander cannot manipulate it. I contact Hitachi and they said that's all they have. We did not use the tool so it might be good if you're right handed. Great at first but questionable durability. I bought this product as I was preparing one house for sale and buying a fixer-upper. While the screwdriver has performed admirably with many people who've borrowed it commenting on how great it is, it died just a few nights ago. The three or four times prior to it dying I had noticed that the chuck had been getting looser and that it didn't have the same amount of torque as when I bought it. The batteries were also not lasting as long. Being a technophile I understand that batteries can't last forever, but Li-Ion batteries should last for a while when they're kept at a good charge level constantly. So I'm disappointed that my trusty little screwdriver is not so trusty. To be fair, it lasted a decent amount of time through a lot of very hard work. When I didn't have my DeWalt 18v cordless drill handy for certain tasks, this screwdriver would drive drywall screws and decking screws all the way down to outlet faceplate screws. It's not a bad product, but today, for nearly the same price I just ordered a DeWalt DW920K-2 which has a variable trigger as well. I've had good experiences with my DeWalt tools and I hope the DeWalt version of this tool proves more durable. PROS: Very handy. Strong when I first bought it. Batteries charge quickly. CONS: It's dead now after 7 months. Trigger is non-variable which makes it hard to use it for more delicate situations. The LED light seems like a good idea but it's mounted on the bottom of the chuck, so it rarely shines light on the actual screw. Plastic body isn't rugged. Trigger is too easily turned on in your pocket (I know it has a lock, but who wants to keep turning the lock on and off?). I bought this driver because I got tired of hauling out the much larger one just to change a few screws (or whatever). It's a lot more convenient in areas where the larger driver wouldn't fit easily. The torque control helps me avoid stripping screw heads when a screw sticks in a tight space. The ergonomics feel good so far--having an articulated handle makes this driver a lot easier to use than a regular screwdriver. I haven't owned it long enough to fully test the lithium ion batteries, but I'm assuming they will be a better alternative than nickel cadmium. This tool works perfect for my use. It replaced a NicD one I bought from Home Depot. Sure it was only $15 on sale but I had to charge the batteries in a short time. This tool also has the lock chuck that I find as a great help. Nothing worse than dropping a bit in a computer. I like that I have an off/on switch for the light. My Ryobi impact driver turns the light on once the tool is turning? The batteries charge quickly and last long enough for me. An important feature for me is being able to straighten it out. Many times I need to reach between some shelves or brackets and can not reach the fasteners properly with a pistol grip only machine. Works excellant in our production area. We have 6 and they are going strong. Just ordered 3 more. Overall I am quite pleased with this little driver. Perfect for light duty around the house. Very comfortable grip, 2X lithium batteries and charger will insure you always have a charge. Pros: Light Weight, decent torque, 2 speeds, adjustable 2 position handle, nice little LED light, variable torque settings including drill mode. With sharp bits, the drill is actually quite handy. Used it for light duty drilling (pre-drill). Lithium-ion bat definitely a plus, no more exercising batteries, and will have a charge after sitting on the bench for a while. Would recommend this little driver to DIY's. Cons: Not the most powerful, but what do you expect from 3.6v. Sinks screws into predrilled holes well, but was working on my deck playing around and was straining to sink 2" deck screws into treated lumber (it did it, but you could hear it work, but again, this is what your 18v drill is for!). Adjustable handle doesn't lock into position. Not variable speed. I'm a weekend warrior homeowner who was looking for a lighter weight cordless tool for light duty jobs around the house. I was tired of digging out my heavy duty Dewalt cordless hamerdrill/drill/driver for a small project. I was considering this Hitachi driver as well as the Bosch PS20. I couldn't decide.......so I bought them both. Amazon had a sale on the Hitachi and I got it for $50 so it was worth a try. I paid $105 for the Bosch. What I like about the Hitachi is that it has suprisingly good power and the two speed gear range is great. What I don't like is that it does not have a variable speed trigger or an electric brake (it keeps rotating after letting go of the trigger). When driving small screws you have to rely on the clutch setting to keep from overdriving. I've stripped the wood in a couple cabinets as a result because I don't always set the clutch right. If these shortcomings don't affect what others intend to use this tool for then I have to say it is a great little tool....the quality and power is super. I noticed today's pricing for this Hitachi is $78 bucks. With the Bosch PS20 at $105 I say its a no brainer, go with the Bosch. But if you are curious and catch the Hitachi on sale go for it, there's bound to be something you could use it for. Used this little beast all weekend on hundreds +/- of assorted fasteners, and have not yet needed to recharge it. I have used a number of power screwdrivers on my job. This is by far the best, very lightweight, yet solid & powerful. Great little screwdriver, locking chuck works well, power is good. I would have liked the led to be white instead of amber, and also have a problem where the unit pivot mechanism works when I don't want it to. I would have liked a lock to prevent this from happening unless needed. I also happened to turn the led on when not needed- the switch for the led is in an overlooked place. Need a power drill that you can just grab and use? We all need a second power drill to either pre-drill a hole, or just screw something in. I put audio racks together that need a lot of screwing and unscrewing. This tool is perfect. It comes will two Li ion batteries, the charger, and a hard plastic case. I keep the charger and the case in the cabinet, and throw the batteries and the tool in my work bag. Just buy it. Great quality. This is my second purchase of this item. The first one died due to a bad fall, but that's no fault of the screwdriver. The battery life and power is amazing. I mainly use this screwdriver for working on computers and it lasts me months between charges. Under heavy load, such as using it as a drill, it will drain the battery much faster. It is very light, portable, and the built in led light is a wonderful bonus. This Li-ion powered driver/drill is very nice. It came with 2 batteries and a charger. The light is very nice, the speeds are fine and I have used it for drilling also. The battery has a pretty good capacity. I replaced a nearly new Black and Decker drill with this unit. The B & D had Ni-metal Hydride batteries which worked only for about a year. The Li-ion is supposed to self discharge only 6%/year if unused versus 6%/month for the Nickel metal Hydride battery. The B & D is a piece of junk compared to this Hitachi. This cordless screwdriver is great. The second battery in the charger hasn't even been used yet after several weeks of typical use. Plenty of torque, the torque settings are a great idea for delicate work and the quick-change chuck fixes the "loose the bit" problem we had with our B&D cordless. Nice little power driver. Good batt life, charges quickly. I've owned a Milwakee, and a Panisonic type like this one. This is by far the best one I used to date. Those two are older technology, batt don't last as long, they go bad after a few months. I work as a field tech, and I use them every day. The Hitachi has really good power for a small driver, a locking chuck to hold the bits, and a LED light at the tip. I saw it at a local store for $95, and almost bought it. When I checked online later, I found it for $48 on Amazon. It was a no brainer, bought it that night, had it in 4 days with the free shipping. I had bought a replacement batt in the past for the other driver, cost $35. For $12 more you get a new Hitachi with 2 batt, charger, and a case. I think this is a great item, worth twice the price. I had paid $129 for the Pani, and $85 for the Millki. They don't even come close. The Hitachi design and color even makes it looker cooler, that was the thing that drew me to it first, but the perf backs it up. Only complaint is the LED is a yellow/org glow, so not as bright as white, plus you have to push the button on/off- no auto off, so the batt could go dead if not shut off. It is not even an issue, just had to find something to complain about. Great power screwdriver for everday use, and great price! I bought this from Amazon because I got tired of the self discharge on the NiMh batteries on my Ol' Milwaukee (a great screwdriver, but poor batteries). I've had it two months and I must say, other than the weird green "paint job", I LOVE IT!. The fast speed is faster then the faster speed on the Milwaukee, no self discharge problem with the lithium ion batteries and overall great performance. For around $72 I got the screwdriver, two batteries and a case (and one philips bit), which I found to be a great deal (check around; you won't find a better price). And I use it every day and have had no problems yet. Even sprang for another spare battery, just in case. I highly recommend it, if you can get past the "green flames". With over 40 years of woodworking and home handyman experience, I have owned nearly every type and brand of cordless screwdriver ever made. I have a drawer full of useless stick drivers that I have bought or received as gifts over the years. The Hitachi DB3DL driver is a horse of a different color. This driver has power to spare and so far has handled any job I have tackled. The power delivered is amazing, especially for a 3.6 volt device, and the battery life is incredible. I plan to give a couple of these as gifts to my 2 sons and thinking about buying myself another one to keep at my model railroad club site. I highly recommend this driver to everyone who has been disappointed in the past with top brand name devices. I bought this mainly for doing the electrical work while finishing off my basement - a lot of tightening and loosening screws on switches, outlets, fixtures, etc... (lots of twisting - but not too much torque required) I looked at other cordless screwdrivers and most were too heavy and large for what I wanted. I wanted something similar in size to a screwdriver - and this is it. Don't buy this if your looking for the power of drill - that's not what it is designed for. The screwdriver peformed flawlessly, saved me countless hours and avoided the sore wrist that comes with constantly twisting a screwdriver. The batteries lasts a long time and re-charge quickly. Aside from the electrical work I used it for - it is now the go-to tool for assembling kids toys, replacing batteries, fixing electronic devices, etc... Best money I've ever spent on a tool. I've been very impressed with this little guy. The batteries last quite a while between charges & on the low speed setting it can drive self-tapping 2.5" deck screws to the hilt without a pilot hole. I've also used the new Makita 9.something volt stick impact driver & there's no comparison- the Hitachi is vastly superior & cheaper. I was expecting the Makita to drive almost as well as a full size drill but it just doesn't have the torque, has only one speed- REALLYFREAKINFAST & no clutch setting options. I also ran a 1989-ish Milwaukee driver & it was able to out-drive the Makita- both had new, freshly charged batteries. I haven't found much use for the fast speed on the Hitachi as it can over drive a screw pretty quickly & doesn't have much torque. The clutch adjustments are very close to each other so you have to make a big change if you want to drive a screw deeper, but it's hard to over-drive if you take it easy on the adjustments. The more I use this tool the more often I reach for it. I originally purchased it to use in tight spaces, but I find myself using it for heavier duty projects because it's easy to stick in a pocket & have handy. My only complaint is that the light doesn't do much good- it's at a poor angle, is an orange color & isn't very bright. I have owned and used this little tool for several years now and if it fell apart today I would buy another one. It is so light, dependable, tough and easy to carry. 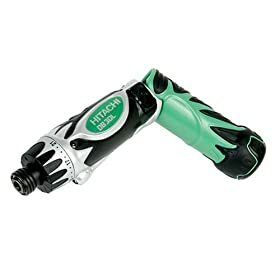 I would recommend this Hitachi Screwdriver to everyone. I have dropped it from second story buildings, used it to hammer in drywall anchors, drill masonry holes in brick and it just keeps on going. Also my little 2 year old boy uses it to play with and if he can't tear it up it must be good. I'm very happy with this item. it performs as expected and more so. I expect many years of reliable service from this product. The Li-ion batteries are the key and replacement batteries are very reasonable.